A colleague and I will be visiting Bhaktapur, Nepal, in October and November to study the feasibility of finally establishing a bricks-and-mortar institute for the study of carfree issues. This has been a priority for me for many years, but this is the first serious attempt to actually establish the Carfree Institute. Eric Britton was kind enough to share his contacts there. If you are in touch with anyone in the Kathmandu area, please send mail. I'll report on the trip in the next issue. If you watch a video, please Like it by clicking the Heart icon in the top-right of the video frame (Vimeo) or clicking the Thumbs Up icon below the video (YouTube). Posting to Twitter and Facebook will also help if you can. We need to get the message out to a broader audience. I know this is a bit of a nuisance, but it really does make a difference. The 20,000 views needs to become 20,000,000 views as quickly as possible. I need your help with this. Carfree.com actively supports World Carfree Network (WCN). Unfortunately, WCN is largely inactive at this point. World Carfree News no longer appears with any regularity. Old issues are available in Czech, English, French, German, Italian, Portuguese, and Spanish. November/December 2012 is the most recent issue. Justin Hyatt tried heroically to keep it going, and he still seeks a return to regular publication. He could use a hand if you have time. "One of the easier ways to measure the health of a democracy is by the size and quality of its sidewalks." While parts of the world have clued in to the dead end road that car-based planning represents, others continue to follow the example of the worst of car-centric urban design. Given the entrenched nature of car culture, a range of methods are needed to resist the madness. One of the tools in our arsenal is action-oriented research. 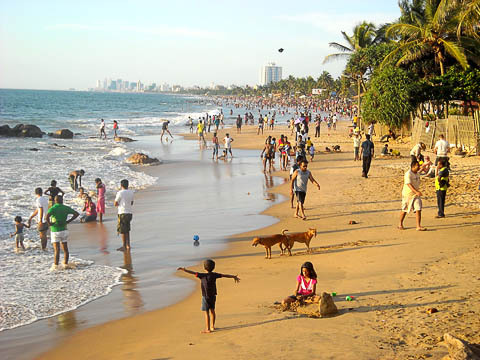 Recently a colleague and I conducted a study on a public space in Sri Lanka, entitled "Public Space and Quality of Life: A case study of Mount Lavinia Beach." The main goal of the report is to give input into urban planning and in particular the creation of public spaces. Following a 30-year civil war, the government of Sri Lanka is now eager to create new public spaces in order to make Colombo an attractive, modern city that will draw foreign investment. 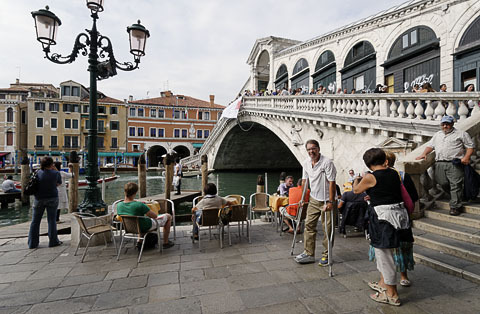 Unfortunately, the tendency of the government planners is to design places that look good but fail to encourage liveliness, and the expectation is that most visitors will arrive by car. The result is several attractive but very dull places. One is Independence Square, which is a popular place to walk. And only walk. As it is not within walking distance of any but a few high-priced residences, it attracts mainly those of high income, and thus lacks diversity of both users and uses. At the square is an army-run "Walkers' Café" which has been dubbed the "Drivers' Café" because it is mainly frequented by those who drive the walkers to the square. Another gorgeous but sanitized place is the Dutch Hospital. Named after the renovated building in which it is located, Dutch Hospital consists of restaurants and shops inside, and an attractive plaza outside with tables and chairs. As with Independence Square, it is not located near residences. Inside are mostly wealthy young people drinking. There are generally a few people sitting in the spacious plaza outside, looking a bit bored. Then there is the Water Park in Battaramulla, so named for its attractive lake which is used for flood water retention. But the park is, again, not located near residences, and the parking lot is almost bigger than the park. Although I've seen Water Park when it's crowded, the so-called children's play area was only being used by people walking, and activity was mostly limited to walking and sitting. But all is not rotten with public spaces in Sri Lanka. A space on the unfortunately named Slave Island, similar to Dutch Hospital but smaller and less attractive, is much livelier, with vendors selling affordable items to lower-income people. Near Dutch Hospital is also the highly popular Galle Face sea wall and Galle Face Green, which are full of people of different ages and incomes, not just walking and sitting but buying, selling, playing, and eating in a festive atmosphere. Although Galle Face is also not accessible by foot from anywhere but five-star hotels, its easy access by train and bus makes it a popular destination. Most of the sea wall and the Green are far enough removed from the road that one can enjoy a carfree experience. Then there is the place that we studied, the Mount Lavinia Beach. The beach is essentially a linear park within a short walk of thousands of people's residences. Some highlights of our findings include that while 21% of people say they drive to the beach, 30% say they walk. 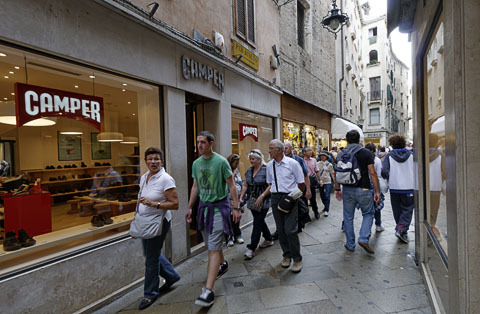 More interestingly, walking is far more common among daily visitors, 70% of whom say they walk there, and only 12% of whom say they arrive by car or van. Even for the irregular visitors, driving is not the main mode. More weekly visitors walk than drive, and more monthly visitors take the bus than drive. While one complaint we heard about the beach is that it is difficult to access by car, that complaint needs to be taken in the context of most people's preferred way of accessing the beach. It is not wise to make access by the majority who arrive on foot more difficult in order to accommodate the few who come by car. Another important finding was partly captured in the activity audits we conducted. The beach is an unscripted place that people feel free to use as they wish. It is a real public space, one that attracts a wide variety of users and uses, inviting all and excluding none. We charted 18 different activities, including various forms of exercise, socializing, buying and selling, and play. 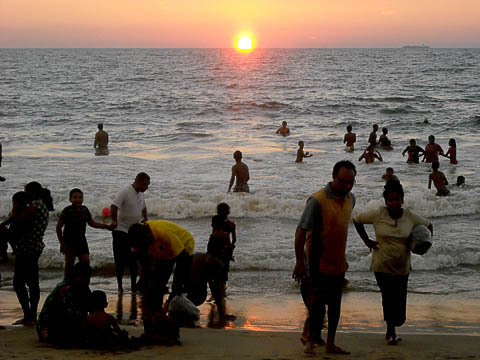 None of the new public spaces in Colombo are likely to yield more than three or four different types of activity. 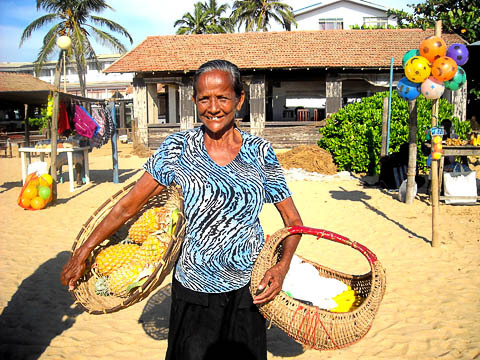 At the Mount Lavinia Beach, we found medium to high levels of many activities across a wide range of ages and income groups and among both sexes. The findings of the survey and activity audit are reinforced by many hours of observation. People love the beach. Those who go to exercise also socialize with others while there. People feel comfortable going alone, as watching others is good entertainment and the beach is quite safe. People feel comfortable taking their children there, knowing they are safe from traffic. Though unacknowledged by most, the fact that the beach is a carfree space is likely one if its greatest attractions. That people should fail to mention that bonus is not surprising. It is hard to notice what isn't there. When the trains, which regularly come roaring by, did not pass for two days due to a rail strike recently, I failed to notice their absence. When I am at the beach, I don't think "how lovely to be in a carfree space!" I simply enjoy the quiet, the safety, and the fresh air. But when I am in a public space that is close to the road, the intrusion of cars - their noise, their smell, the danger they create - is an ever-present nuisance. 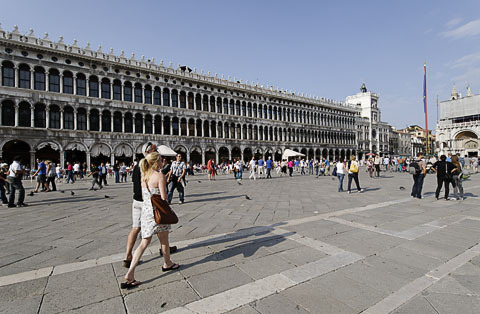 The research is important because it gives us the evidence to state the obvious: a public space will not be popular and well-used if it can only be reached by car. It needs to be accessible by foot from nearby residences and by public transit, so that people will be able to use it on a regular basis. Furthermore, there is no need to take away space in order to accommodate cars. 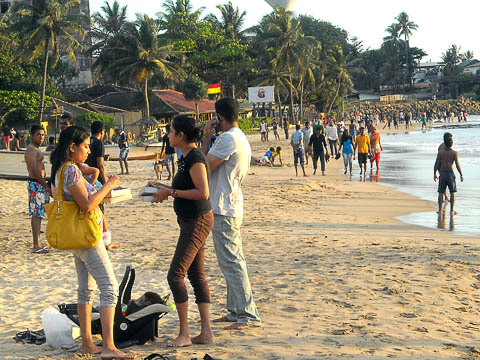 The liveliness of the beach, as with other popular public spaces in the city, is partly due to the presence of vendors who provide affordable eating options and add to the vivacity of the scene. For a public space to be real, it cannot target only those of a high income, nor should it only attract the poor. A true public space will be so attractive and inviting that people of a range of incomes, of both sexes and different ages, will regularly visit and enjoy it. And finally, it is vital that public spaces have an unscripted nature that allow people to step out of the box of their daily lives and use their creativity to shape the space to fit their needs and desires. We did not find anything terribly surprising during this research, but the messages are important. Yes, people want to use their cars, but they also want liveliness, fun, and a chance to socialize. They want safe places where their children can run free. That is, they want the benefits of the car but can readily appreciate the advantages of a carfree space. We need to emphasize access by means other than the car, or we will destroy what we are trying to create. And we must balance people's desire to use their cars with their other desires and needs. That is, if we gave people what many say they want - endless free parking, wider roads, more highways - we would create barren landscapes that people would then reject. We need to remind planners that they cannot give people everything they ask for, and that some demands are far more important to satisfy than others. People might want a parking lot, but it won't make them happy the way a good park can. People might prefer to drive, but if we offer them good public transit and great environments for walking and cycling, then those options will gain popularity. It is not easy to counter all the propaganda put out by the combined forces of the automotive, fuel, and road-building industries. It is not easy to overcome the force of habit. It is not easy to convince people that there are far better options out there than to continue with the car-based model of development. We have to think of many different ways to get our message across. We must draw new interest groups into the discussion of how we will design our cities. I hope that this study will help advance that debate in Sri Lanka and beyond. The full study is available in PDF format on the HealthBridge website under Livable Cities publications. Carfree Times and Sustainable City News. 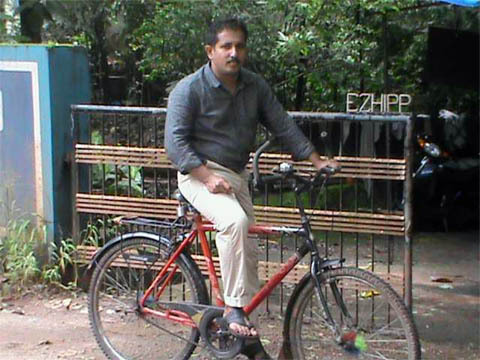 "Cycling has become a part of my life now," says Mr. Reni Varghese (39yrs; no relation to the author) who works as a Special Village Officer in the revenue department of Kerala Government. He has been cycling to work for the past six years, and all he had to say was about the health and environmental benefits of cycling. He cycles around 20km (to and fro) per day. Mr. Reni started cycling to work after trying different ways of physical activity such as walking, jogging, etc. The time spent for exercise and the cost of transportation prompted him to think of cycling to work at first, which was later reinforced by the newspaper articles portraying the benefits of cycling and examples elsewhere in the world. He now takes a motorbike or car to travel only for long trips. "People around me were surprised to see me cycling to work, at first," he recalls. He remembers the faces of people gazing upon him with ridicule. He says that in Kerala there's a strong notion that cycling is inferior and only the poor use bicycles. According to him, it's the attitude of people that must change to attract more people to cycling. A few of his colleagues also started to cycle to work, but they had to drop it soon. At the beginning he too found it difficult to overcome these societal pressures. Mr. Reni was born in a middle-class family. His grandfather and parents were teachers, so he is well known among the people in the area. He sees many known faces on his way to work on the bicycle. He takes time to wish them well or sometimes stops for small talks. He takes a short way to office, avoiding the main road. For him, it's a rejuvenating experience to ride through his daily route with paddy fields, streams, and trees alongside the road. Only when it rains heavily does he switch to other modes of transport (motorbike or car). He doesn't dream of roads with separate bicycle lanes, as he's of the view that such infrastructure improvements won't take place in the near future, especially on roads he use for cycling. "I could no longer cycle to work," he thought when he was transferred to another village office 25km away. Not ready to give up, he travelled half way on his bicycle and locked it at his aunt's house, where he switched to his motorbike for the remaining part of his travel. For him, cycling has brought many changes. He recalls that he weighed 75kg before he started cycling to work and now he is down to the 60kg which he thinks is proper for him. He used to spend to spend INR 200 (about US$3.00) for fuel for his motorbike each week for travel to work. He says that cycling keeps him fresh and fit all day. He has never visited a doctor in the last 6-7 years, he says. It also gives him a sense of pride when he thinks that he is not harming the environment like the many others who use motor vehicles. "I could also control my anger," he says, when asked further about changes. He is now less troubled by the minor irritations of life. 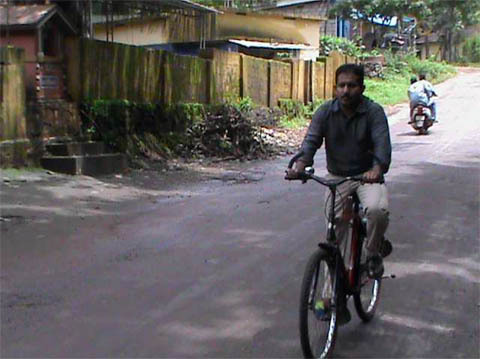 Mr. Reni asserts the need for inculcating cycling habits among school children. He feels that it will make children more independent. He recalls his childhood experience of the insults he faced from the Pvt. Bus employees while travelling to school. For them, a student who travels at a concessional rate was no replacement for an adult passenger who pays the full ticket price. He says that the transportation demand is not met during the peak hours, which creates traffic problems. Cycling is the best option, according to him, to overcome this problem at a low cost. By word of mouth, he encourages people to cycle to work. "We can build a healthy nation if more people choose to cycle," he says. with the support of HealthBridge, Canada. "Due to Global Warming, End Is Virtually Certain for NYC, Boston, Miami, Holland"
"Climate change: IPCC issues stark warning over global warming"
"Denial of Nature's Limits is the Problem"
"Seven facts you need to know about the Arctic methane timebomb"
"Arctic sea ice shrinks to sixth-lowest extent on record"
Much is being made of the fact that this summer's Arctic ice melt is not as bad as it has been in some recent years. That's not saying much: 2013 belongs to the new cohort that began with the major melt in 2007. This year, as in every year since 2007, minimum ice extent is smaller than in any recorded year prior to 2007. (Guardian UK) Incidentally, the best single source of information I am aware of is The Cryosphere Today. "ESA's Cryosat mission observes continuing Arctic winter ice decline"
"International Energy Agency urges stop-gap climate action"
"Air Pollution Is Not on Political Agenda in Denmark"
"Wall St. Exploits Ethanol Credits, and Prices Spike"
"Radiation at Fukushima Soars to Highest Level Yet"
"Living Near Good Transit May Make You Happier"
"Maybe buses should be free "
"Bristol car-free Sunday closes roads"
"Cargo Bikes: The New Station Wagon"
"Spanish saddle up and ride the bike boom that's sweeping the country"
"The Dutch Prize Their Pedal Power, but a Sea of Bikes Swamps Their Capital"
"When Tokyo Was a Slum"
"Cities Are a New Kind of Complex System"
"Agenda Plus: J.H. Crawford on Car-Free Cities"
This is a beautifully-produced book from the Congress for the New Urbanism (CNU) that can be taken as the comprehensive set of standards for the New Urbanism (NU). While I have expressed some doubts regarding NU and feel that in some ways it does not go far enough, it is clearly a large improvement on business-as-usual urban planning and design such as has been practiced in the USA for decades. One of the most commendable things about NU in general and this book in particular is that it is rich in illustrations that can be grasped in moments, rather than pages of dreary text that are hard to absorb. The urban transect is an especially useful concept and one that should be widely applied. Another important innovation of the CNU is the "form-based code," which shows, rather than tells, how to design buildings for a given part of a city or town. This method is discussed and illustrated. As I am sure most readers know, CNU promotes walkable, mixed-use neighborhoods that are more sustainable and better places to live. Case studies, plans, and examples are used liberally throughout the book. In particular, the book considers how the disasters of suburban development in the USA can be countered by planning and designing neighborhoods that look much better and should make people happier. The book considers all scales, from the regional down to individual buildings. Many of the solutions proposed should be very familiar, as they are actually drawn from our rich urban and architectural heritage. These are approaches that are not based on one or another flighty system of philosophy but have been tested for centuries and shown to meet human needs well. I still wish the CNU would get behind the carfree initiative. Some of its practitioners, especially Peter Calthorpe and the Krier bothers, are just millimeters away from pure carfree urban design. I hope they'll make that last little jump. We missed this first time around. It's people-centered transport policy and practice from a mainly Asian perspective. Well worth a look, and you can't beat the price. The next issue of Carfree Times is scheduled for December 2013. Thanks to those who suggested articles for this issue: Robin Bassett, Owen Blacker, Piper Hollier (who also found many errors during proof reading), Dexter Jeannotte, Rick Risemberg, and Clyde Verner (also for proof reading). And thanks of course to Debra Efroymson and Jinu Varghese for their contributions. We welcome articles on a wide variety of subjects and offer an opportunity to publish letters to the editor and guest editorials. High-quality photographs are always in short supply. Drop us an e-mail and get involved!